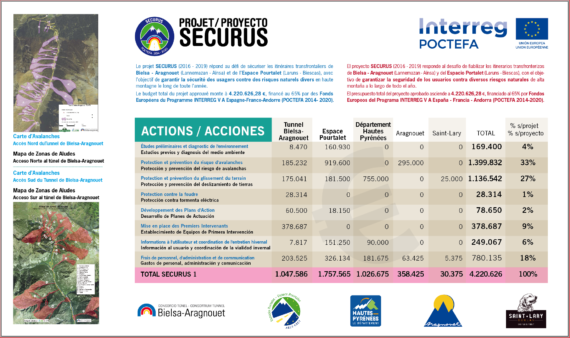 On July 1st 2016, we have begun with great enthusiasm the SECURUS 1 European project in two road axes such Bielsa – Aragnouet (Lannemazan – Aínsa) and Portalet (Laruns – Biescas), in order to ensure the safety of its users against natural hazards. From this date on, until June 2019, the project partners will carry out various actions on issues such as prevention and protection against avalanche risk, against the risk of slippage and soil erosion, and against thunderstorm damage risks, as well as developing and updating the security plans, articulated on a first aid team. The coherence and strength of the project lies in the fact that it is developed by two cross-border territorial cooperation structures (CTBA 2008 and EGCC 2011), which have their own resources and experience in POCTEFA projects (Gescontrans, Bidirex, Espalet), with a common problem at natural risks, seeking synergies and innovative solutions. The total amount of the approved project is 4.220.626,28 €, 65%, cofinanced by the European Regional Development Fund (ERDF) through the Interreg V-A Spain-France-Andorra (POCTEFA 2014-2020). The aim of POCTEFA is to strengthen economic and social integration of the border area throughout Spain-France-Andorra. Their help focuses on the development of cross-border economic, social and environmental activities through sustainable territorial development strategies. In short, Europe is on our side and, through this and other projects, she acts in our environment, promoting communication and exchange between European people, thus erasing the ancient boundaries.